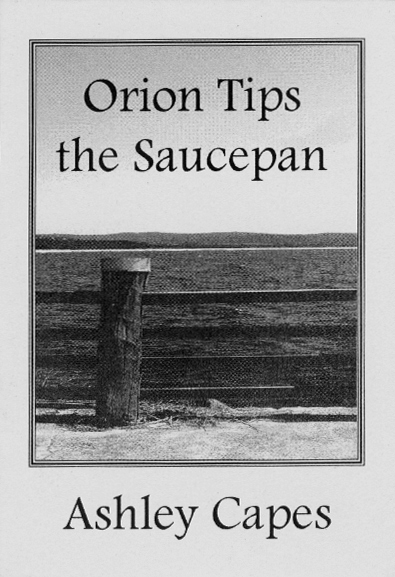 Orion Tips the Saucepan is my haiku collection, first released by Picaro Press (2010) and now available here from Ginninderra Press! It’s my first haiku collection and includes a renku I led some time ago and which was first published in Notes from the Gean. The collection is a neat, A6-sized, 24 page chapbook, printed beautifully and available for $5 incl postage – both by contacting me here, or e-mailing me ( mountain0ash[at]gmail[dot]com ) and at the GP site via paypal. Graham Nunn gave me a copy of this book yesterday, at the end of the series of ginko he has been conducting in the urban wilds of Brisbane, saying, “Happy Esater”. Thank you Graham, and thanks Ashley, for this collection. Far more than black fell out! Too igorrunt to review. Just note that I searched for your blog, gave up looking for an e-mail address, eventually found this page, and wrote this message! Hi John! Wow, thank you, that’s fantastic! I bet you aren’t too ignorant at all, and with Graham to give advice, you’re in fine hands indeed. I posted an amendment in the ‘About’ section – thanks for picking it up actually, I’d totally missed that! And congratulations on this web site too. I shall linger later today.